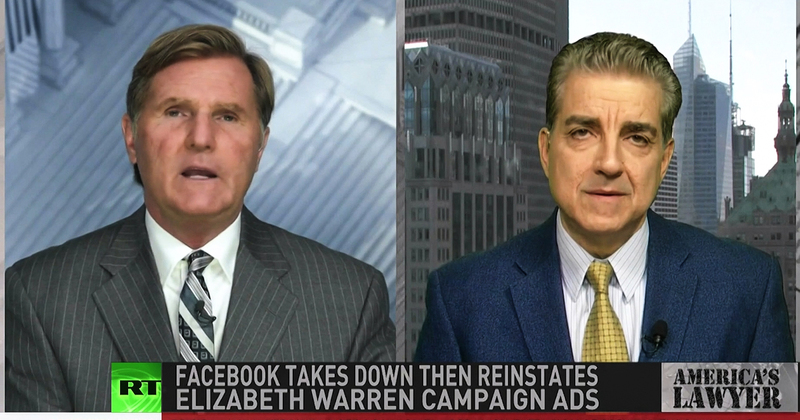 Via America’s Lawyer: Political Commentator Steve Malzberg joins Mike Papantonio to talk about the controversial decision by Facebook to remove several ads placed by Senator Elizabeth Warren presidential campaign, that called for the breakup of Facebook and other tech giants. Mike Papantonio: Facebook removed several ads placed by Senator Elizabeth Warren’s presidential campaign that call for the breakup of Facebook and other tech giants only to later reverse the course after Politico reported on the takedown. Joining us to talk about this story is Steve Malzberg. Steve, you know, the stories on Facebook are amazing to me. At 10 years ago, 15 years ago, you’d never say that there was really any controversy. There was no, there was never anything that was particularly questionable about the conduct of the folks that run Facebook. Nowadays, it’s every single week where something like this has uncovered. The ads, which included a video in this situation directed to users, to a petition on Elizabeth Warren’s campaign website, urging them to support her plan to break up big tech companies. Next thing she knows, they pull her down. What is your take on this? Steve Malzberg: Well, that’s my problem and we’ll get to Elizabeth Warren’s plan to break up the tech companies. But my problem with Facebook and the tech companies is their censorship and that they don’t have to answer to anybody. And they claimed that this was against Facebook policy. Then they claimed that, she used, Elizabeth Warren used Facebook’s logo in the ad, which is against their policy, but they said in the interest of robust debate, we are restoring the ads. Now, they never would have restored these ads if it wasn’t pointed out to them. And if it wasn’t a powerful United States senator who was involved here, who might, you know, be able to present legislation against Facebook. But then again, they make their own rules. So if somebody is putting out something that says, you know, do away with Facebook or breakup Facebook and puts an ad up there on Facebook, if I’m Facebook, I’ll take it down. Who’s going to stop me? They make their own rules. They have to answer to nobody. So they have the ability to do it. Why not, why not do it? Mike Papantonio: Steve, here’s, here’s, here’s the bigger problem. I, I heard an interview the other day where the, where the it was in regard to as the new snow, the new snowflake mode of operation. And that is somebody offends somebody on Facebook. And even though we as taxpayers helped pay for the infrastructure for Facebook, for some reason we forget that. People forget the taxpayers helped build the infrastructure, paid for these fiber optics, paid for a lot of stuff for Facebook. Facebook then added on to that and made, made it what it is, but they couldn’t have done it without the participation of, of, of, of taxpayers. Now the, these snowflake regulators as I heard them referred to and I think it’s probably pretty accurate. Don’t offend anybody. Oh my gosh, you hurt our feelings. We’ve made a decision that what you’re saying is not appropriate. This, these word police are completely in charge of what we think, what we say, what we legislate, what we discuss, what we argue about. And it is just a disaster. I don’t know how else to describe it. What’s your take? Steve Malzberg: Oh, I, I could not agree more with you. It is out of control. And again, they and the case of Facebook and in the case of Google and in the case, you know, Youtube through Google and, and all the other platforms like Apple just took down according to the, the founder of this app. It was, it was an app that went against the grain on the, the popular thought on global warming or climate change. He pretty, he’s a geologist. He presents a whole bunch of facts that he says show that Al Gore and the, the others are wrong. Apple reportedly took that down and, and they have no one to answer to it. It’s outrageous that they are the thought police, the word police. They decide who gets hurt, who doesn’t get hurt, who doesn’t get, who gets to monetize their, their product, who doesn’t. And that’s where we need regulation. That’s where these companies are getting away with murder. I mean, somebody’s got to rake them in. Mike Papantonio: Here’s the way in the way in is to, to equate them with a public common kind of argument. They are using the public commons to deliver this product. They’re making billions of dollars with. Senator Warren, she also said that she, she’d seek legislation requiring that certain large tech companies be designated as platform utilities. You understand? And broken apart from any participate in any kind of participation on a platform. And that’s the, that’s the attack. That’s the approach. Understand they are a quasi public platform in the fact that taxpayers, but for the investment into infrastructure by the taxpayers, they wouldn’t be, they wouldn’t be a platform at all. So now this idea, they’re going to legislate what we think about what we say. We’re going to have Zuckerberg making decisions like that, really? You know, look at, look at the decisions they’re making with no accountability other than to say we just didn’t like what you said and we made this decision. It is time, it is time to break these folks up. Time to break them up. Steve, you see it any other way? Steve Malzberg: Well I agree with the, the, the, everything we’ve discussed so far as far as the thought police or the speech police and the snowflakes and they target, target conservatives like me and others more so than the other side. So I agree with you on everything you just said and I think we could regulate that. I begged them to regulate that without breaking up the companies. What she’s, you know, introducing and legislation is to prohibit companies from providing a marketplace where they could sell products by participating in that place. In other words, tech companies that offer an online marketplace or a platform couldn’t own the platform and any of the companies that compete with each other in that platform. She also wants to undo previous mergers. Like she doesn’t like Facebook acquiring whatsapp or Amazon purchasing whole foods and Google buying a ways and, and a double click. I don’t have a problem with those that don’t have a problem with those. Mike Papantonio: Well, I got to tell you, we have to do, we have to be all in on this. You, you and I might disagree with how extreme it is. It has in my mind, having looked at the antitrust cases over the years and having looked at the history all the way back to the 20s the only solution is to break them up. Steve, thank you for joining me. Okay. Steve Malzberg: My pleasure. Anytime.